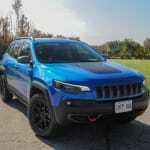 When the Cherokee was launched in 2014, it was rather unsightly. The design did eventually grow on me, and while the quirky front fascia never quite looked right, the rest of the design aged well. For 2019 however, the Cherokee has been given a facelift, and gone are the weird three-stack front lamps and tiny grille. 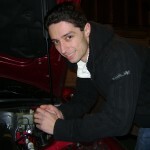 The proportions on the fascia have been corrected and the lighting sorted out, now with the latest LED technology. The 2019 Cherokee is actually quite the looker; especially in the new top-tier Overland trim with slick color-matched cladding. 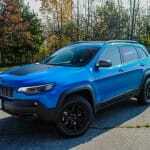 The new look is only part of the equation here; the Cherokee now offers a third engine option as well, a particularly interesting 2.0L turbocharged unit. 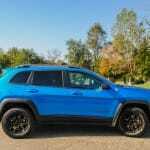 We were set up with a fresh 2019 Jeep Cherokee Trailhawk Elite trim, to get a better sense of what these updates are all about. 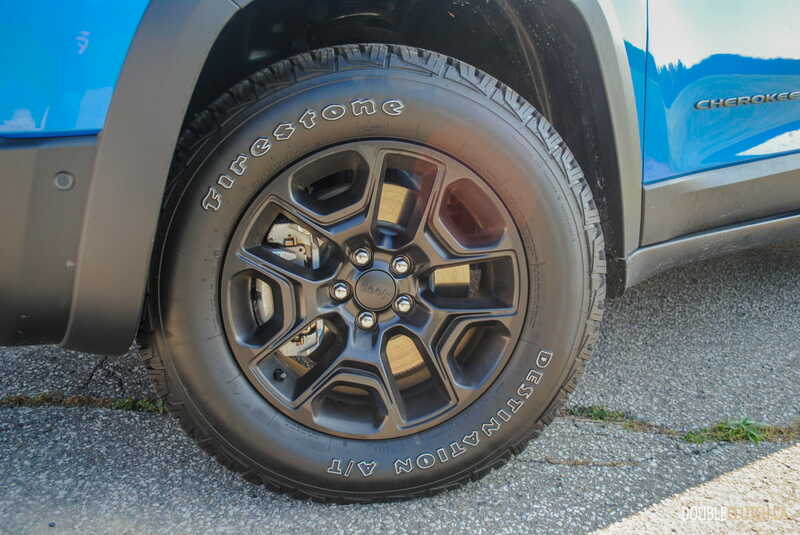 Our tester, finished in well-suited Hydro Blue Pearl, looks fantastic in Trailhawk guise; sporting black 17” rims and tall profile Firestone all-terrain tires with raised white lettering. 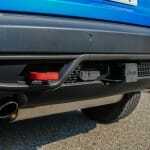 It also has LED fog lights up front, bright red rubberized tow hooks, and two big exhaust tips at the rear to legitimize its off-road credentials. 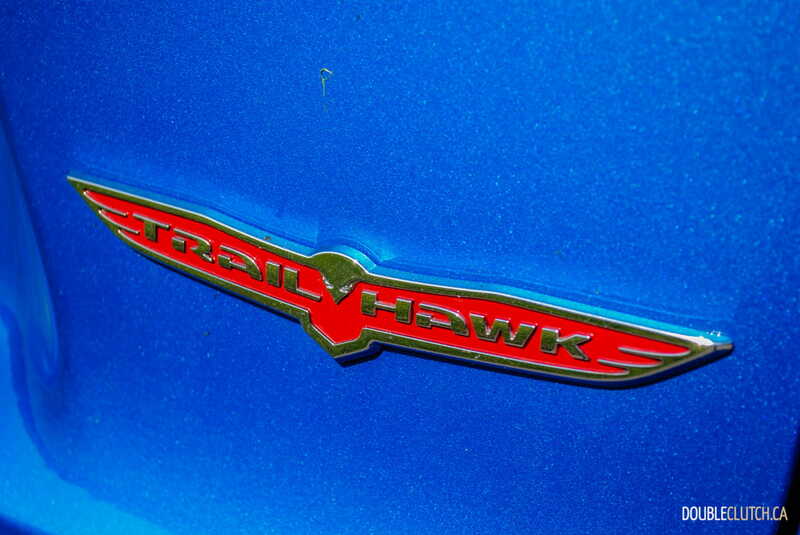 In fact, the Trailhawk remains the most off-road capable CUV in its class. 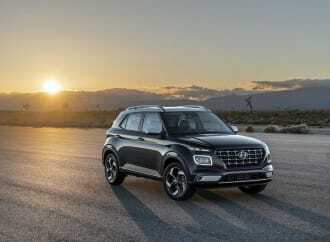 Under the hood is the new top-tier 2.0L turbocharged four cylinder, outputting 270 horsepower and 295 lb-ft. of torque at 3,000RPM. 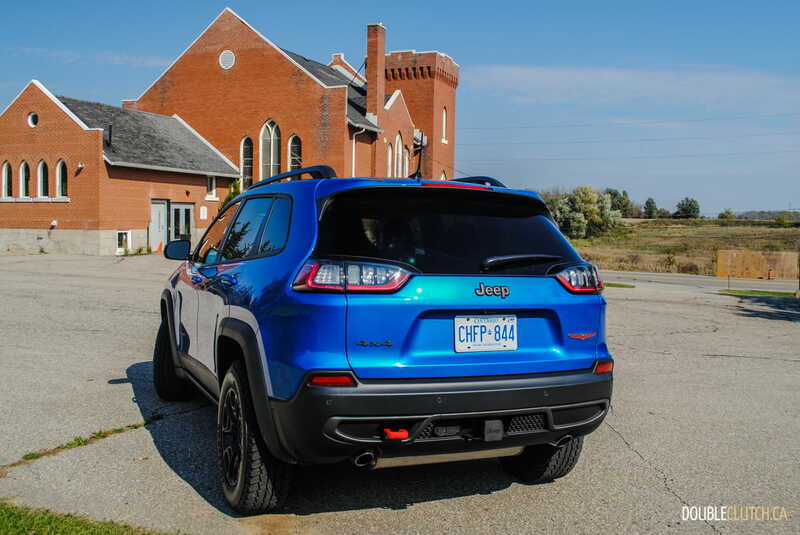 The engine is actually a $995 upgrade over the time-tested 3.2L Pentastar V6 that comes standard on the Trailhawk. 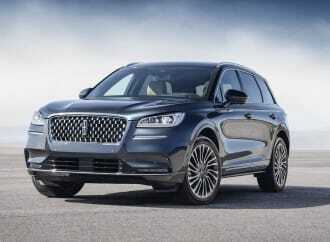 Interestingly, the V6 puts out about the same horsepower, but only makes 239 lb-ft. at a higher 4,400RPM. 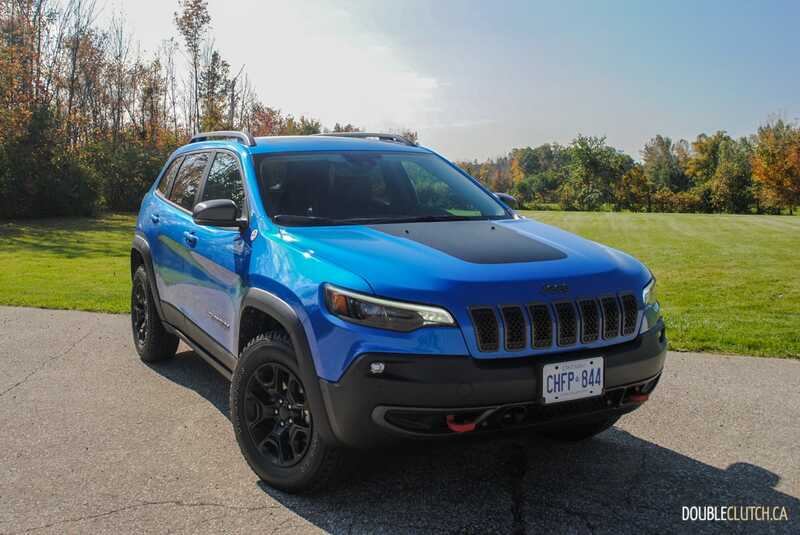 At the bottom of the totem pole sits the base 2.4L Tigershark four cylinder that offers significantly less power, and in my experience is not well suited to the Cherokee. 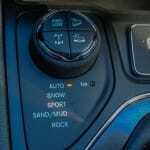 All engines come mated to an updated nine-speed automatic. 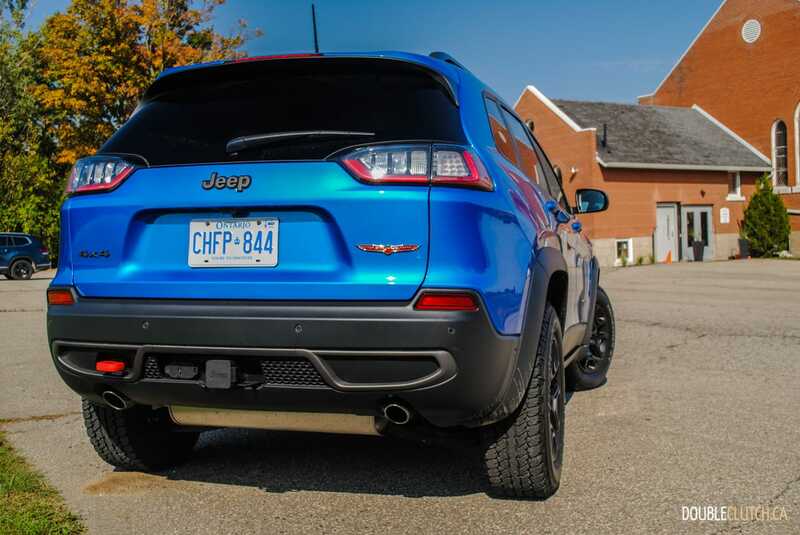 Thanks to the 2.0L turbo’s greater torque output, it does feel peppier than the V6, and has plenty of passing power both on city streets and at higher freeway speeds; making our test Cherokee one of the quicker crossovers around. 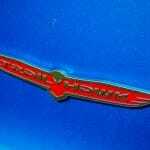 The power doesn’t come without some sacrifices though, and the turbocharged mill does sound awfully gruff at certain RPMs. 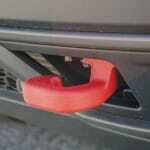 Under regular acceleration from a stop, one can often hear a rattle entering the cabin through the firewall. 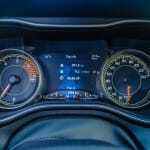 Turbo lag is also a bit of an issue, pronounced moreso on occasions where the nine-speed auto delays downshifts. 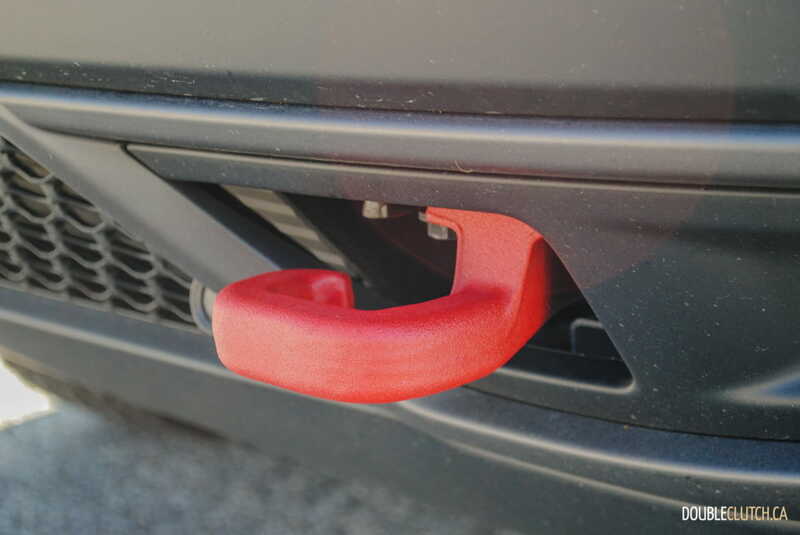 The 2.0L also doesn’t get the best-in-class tow rating (4,500lb.) 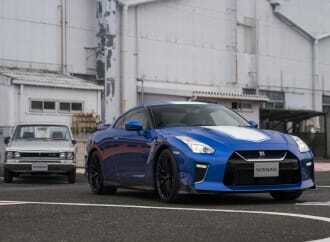 of the V6. I was fairly impressed with the 9.6L/100km fuel consumption average for my week of rush hour commuting. 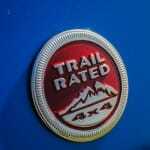 However consulting a 2014 review of the Cherokee we tested, which was not a Trailhawk but a more basic 4×4 North trim, we had averaged 9.3L/100km under similar conditions. I did get the 2.0L turbo down to 9.2L/100km on a longer road trip, but overall there isn’t a huge gap in real-world consumption between the two motors, and both are happy on regular 87-octane. 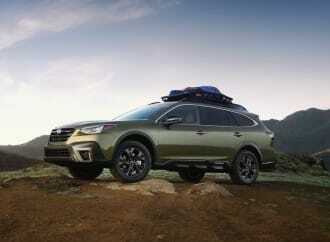 Essentially, you’re choosing between the more refined V6 with its larger towing capacity, and the new turbocharged-four with its increased torque and sharper response, but less refined experience overall. My personal preference lays with the V6, but the 2.0L is a worthy addition to the lineup and well worth considering if speed is your thing. 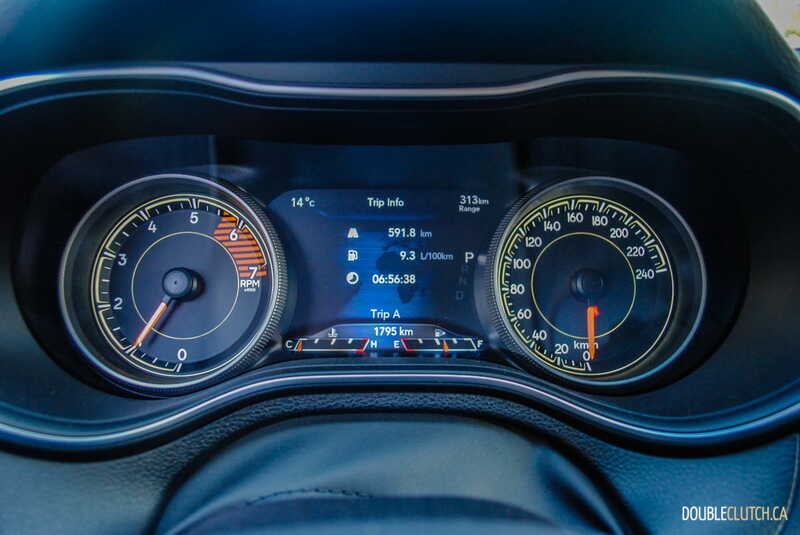 Plus, it is nice to see FCA with a competitive premium four-cylinder in the stable. 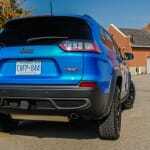 I mentioned the Trailhawk’s off-road prowess and that is enabled by its Active Lock 4×4 system. 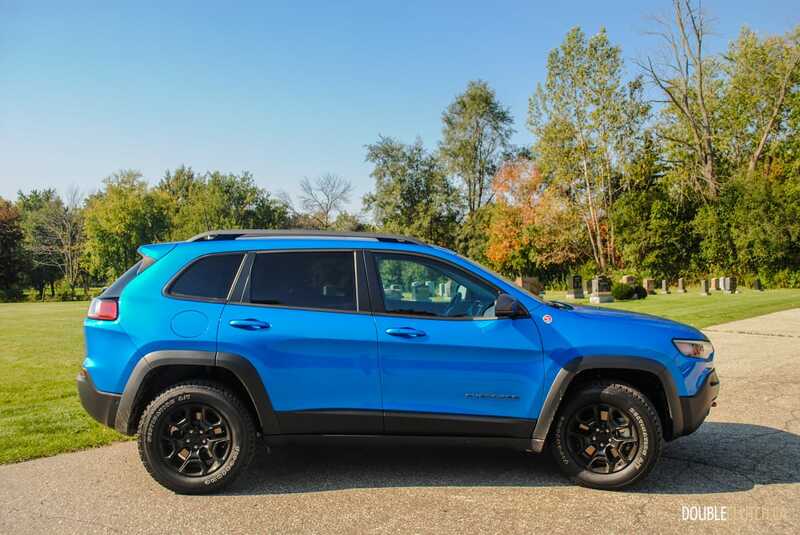 The best of three systems offered on the Cherokee; it features a locking rear differential and low-range gears with a 51.2:1 maximum crawl ratio for proper off-road use. 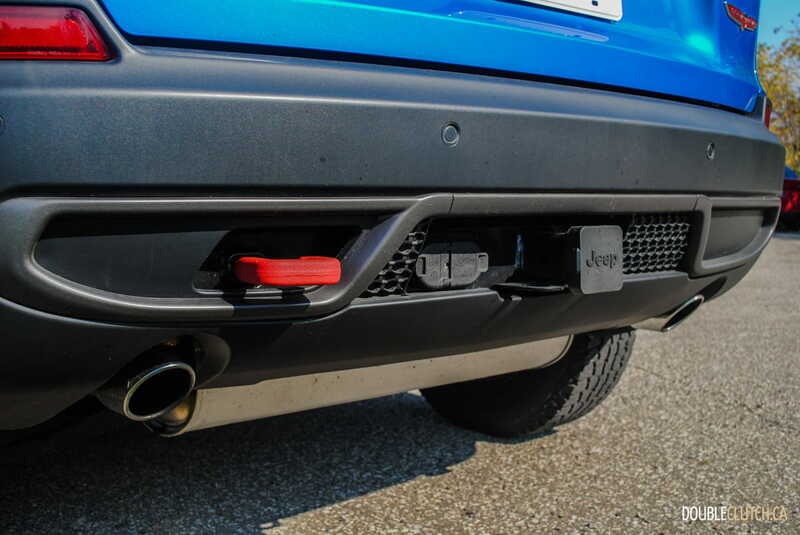 The Trailhawk also benefits from 22cm of ground clearance, an approach angle of 29.9 degrees, departure angle of 32.2 degrees and a breakover angle of 22.9 degrees. Maybe more impressive than that are the improved electrical and body seals, which combine with the high air intake setup to allow the Trailhawk to ford water up to 48cm deep. 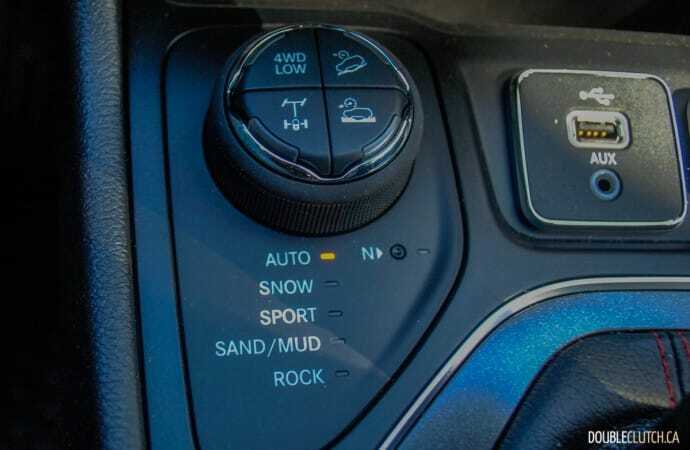 All 4×4 Cherokee models get the Selec-Terrain traction management system which allows you to select the terrain you’re driving on to optimize traction. 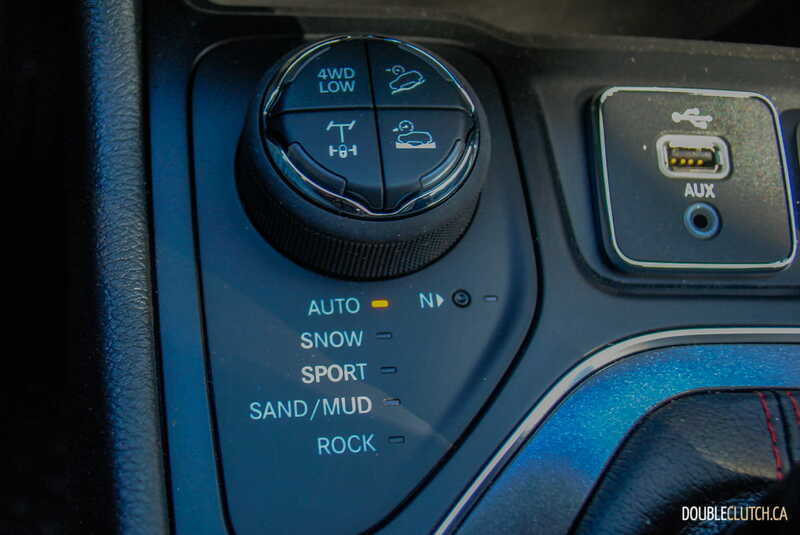 The four standard modes are Auto, Sport, Snow and Sand/Mud, and the Trailhawk gets an additional Rock mode. 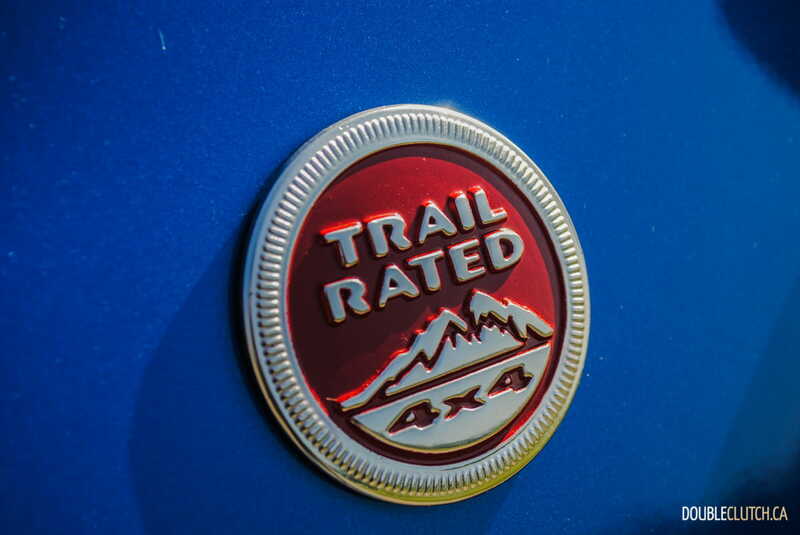 Simply put, there is no other crossover that can hold a candle to the Trailhawk when it comes to off-road capability. On the road, the Trailhawk feels surprisingly tame and actually quite comfortable. 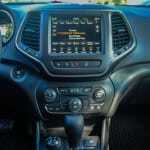 The ride is solid and well mannered, and steering provides a nice sense of control. 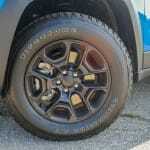 The all-terrain tires are a bit noisy on the highway, but that’s expected with such aggressive rubber and becomes part of the Trailhawk’s off-road character. 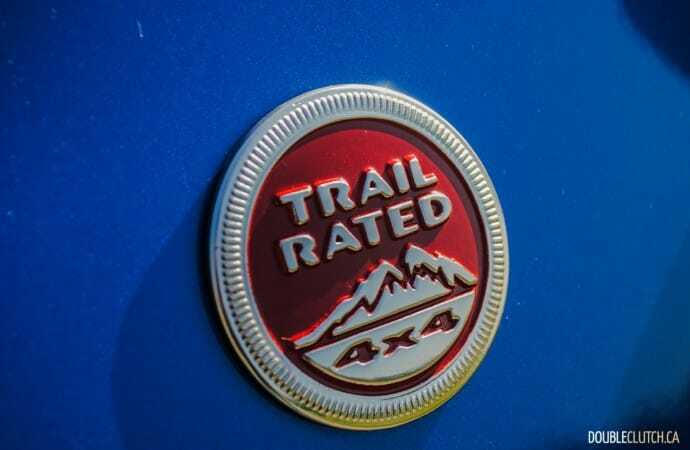 This is a well-balanced crossover that can be a comfortable commuter, family hauler and weekend trail warrior – that’s a very unique combination. 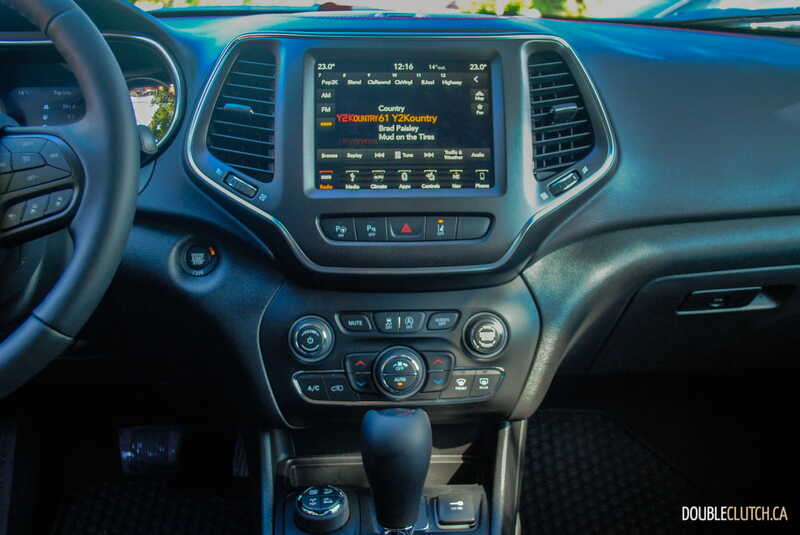 The interior in the Cherokee hasn’t changed much from its original iteration, but being a Trailhawk Elite, our tester did come with a long list of fancy options and electronics inside. 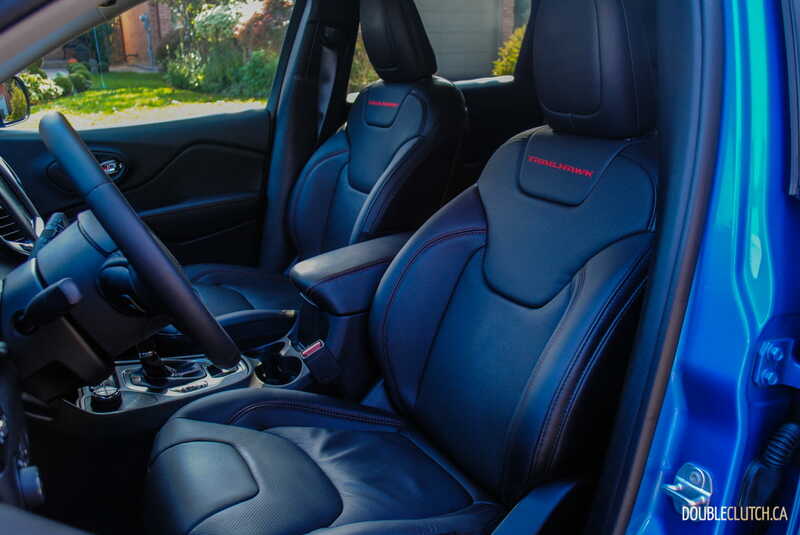 The Nappa leather-faced heated and ventilated seats with full power adjustability on both sides, proved comfortable, and the adaptive cruise control added as part of the Technology Package was also put to good use. 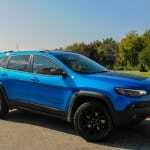 Overall fit, finish and quality of the materials inside the Cherokee is nothing to be impressed about, but the very logical and ergonomic layout is impressive. 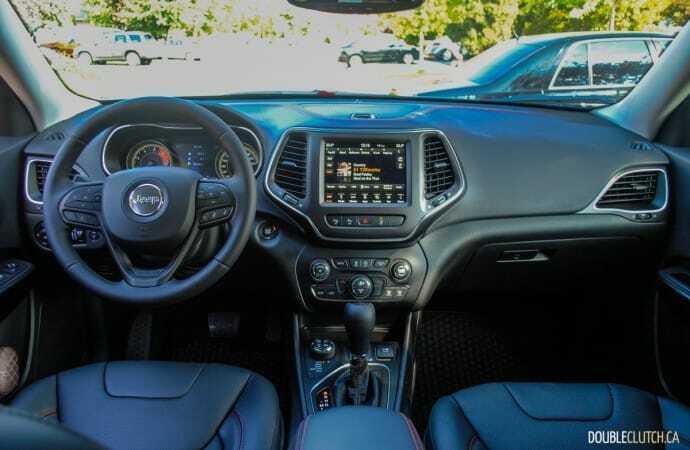 There is plenty of storage everywhere, including in a bin under the front passenger seat, two nice side-by-side cupholders in the center console and another set in the front door pockets. 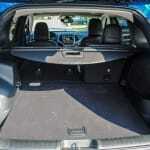 A large center console storage bin and generous glove box mean there are plenty of places to keep daily items up front. 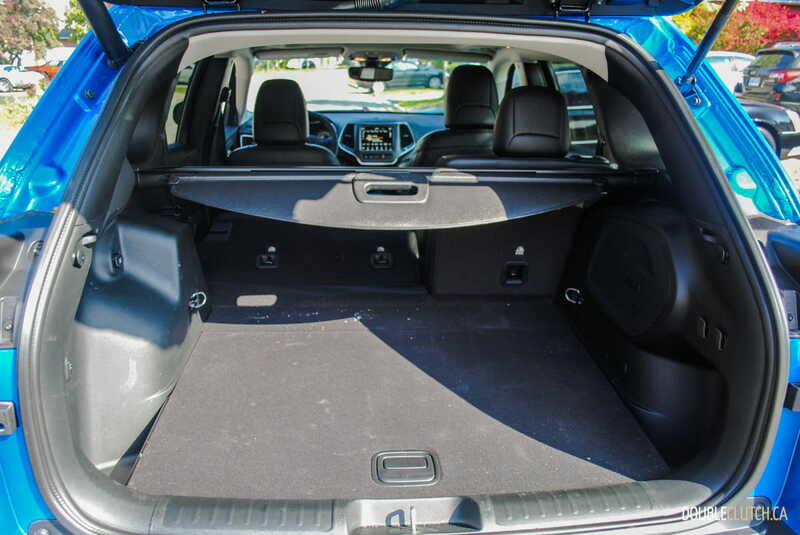 Rear passengers get just enough leg room and plenty of headroom, plus they can enjoy a nice leather armrest with two cupholders in the middle of the split bench. 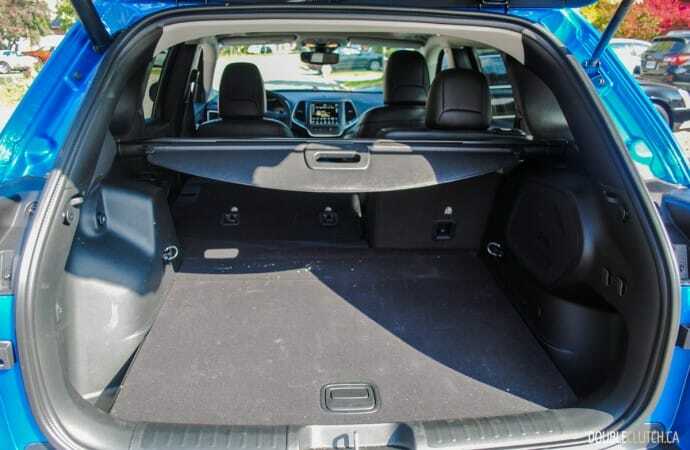 Even with the rear bench upright there is a fairly large cargo area, and the seats can be folded flat for bulkier cargo. 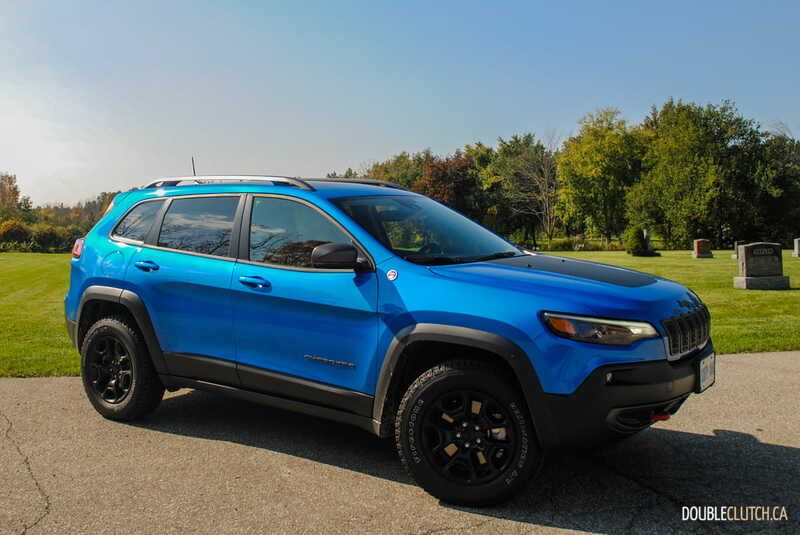 The Cherokee does offer a good value as well, provided that you’re careful with your option selections. 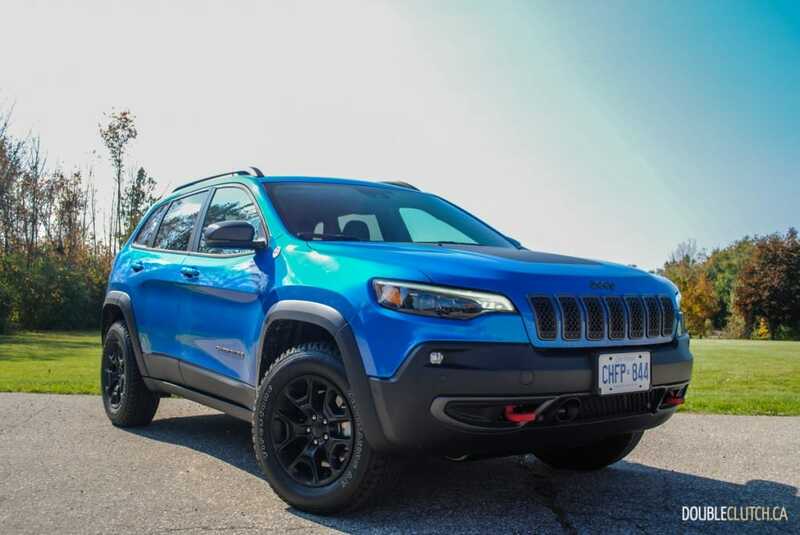 You can get into the most basic Sport model with FWD for $26,745, the Trailhawk starts at $32,995 and the Trailhawk Elite like our tester starts at $35,990. 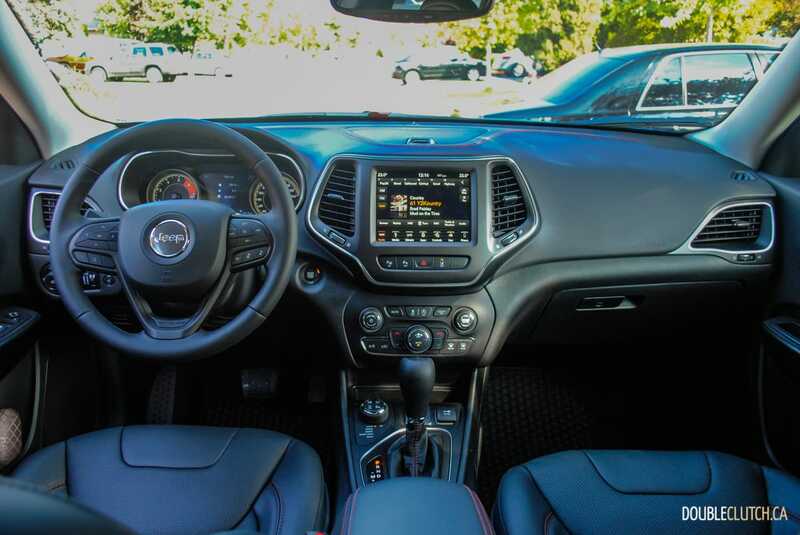 On top of that price, our tester got $6,545 worth of options including the panoramic roof ($1,595), towing package ($595), Safety Tec ($895) for blind spot monitoring and the rear park assist program. 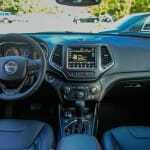 A Tech Group ($995) whch includes more electronic driving aids such as the adaptive cruise control, and our tester also got the larger 8.4” touchscreen with navigation ($920) and the upgraded nine-speaker sound system ($450). 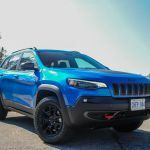 The sticker came to $44,530, which is a lot of money for this segment, but it wouldn’t be hard to cut back on some options and get yourself a nicely equipped Trailhawk for under $40,000. 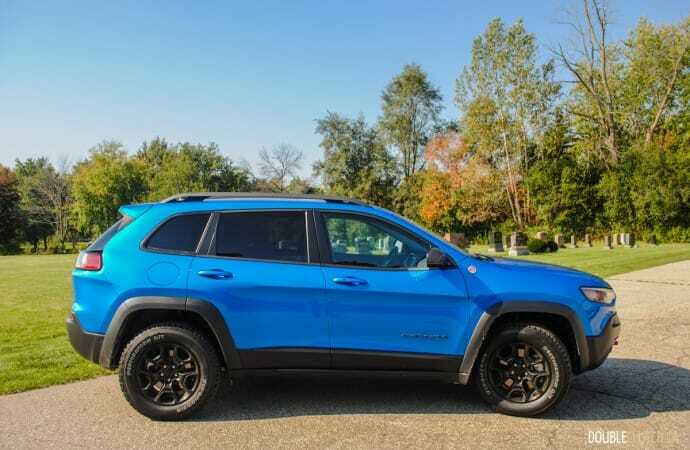 The 2019 Jeep Cherokee Trailhawk remains one of my top choices in the segment simply because it offers more than any competitor in the way of actual capability. 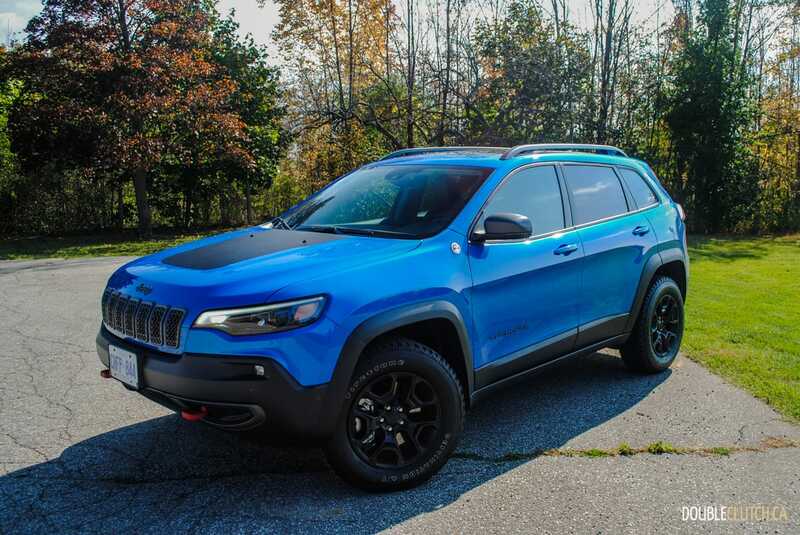 It’s more than just a lifted car; the Cherokee is a proper Jeep, can be used as such, and comes with all the personality the Jeep brand has become known for. 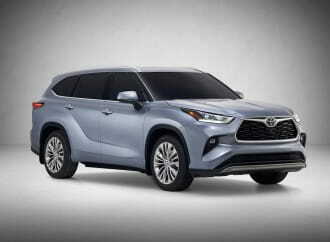 The new 2.0L just adds another great choice to the option sheet, and the fresh front fascia makes the whole package much more agreeable.